Average Height	: 19" - 24"
Average Weight	: 50 - 60 lbs. Samoyeds are an ancient working breed. The hardy and sweet-tempered Samoyed was originally used to hunt, herd reindeer, guard their properties and haul sledges for the Siberian ‘Samoyede’ people who hunted and fished in the Siberian areas. It is believed that the Samoyede treated these working dogs kindly, allowing them to join in with family activities at the end of a day. It was this closeness that created a sense of trust and loyalty in the breed that remains today. 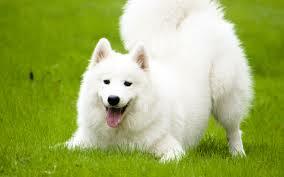 Samoyed’s gene pool is closely related to the primitive dog showing no wolf or fox mixed in. These brilliantly white dogs slept with their people to keep them warm. Several stories and documents show varying growth of this breed out of Siberia to other parts of the world. #1: A Samoyed named ‘Antarctic Buck’ is said to be the very first brought to England. Queen Alexandra was an enthusiast of the breed and many present-day English and American Sammies are descended from her kennels. #2: Also documented is that the explorer, Robert Scott brought these dogs to England in 1889 where the breed was further developed and from there their popularity grew and spread throughout the rest of the world. #3: Other documents show Samoyeds were scooped up and out of Siberia at the end of the 19th century and the early part of the 20th century to pull sleds on polar expeditions, including Sir Ernest Shackleton's famous journey to the Antarctic. These dogs endured terrible hardships along with the explorers they assisted. Only the strongest and fittest dogs survived such expeditions. •	Gentle, devoted, easygoing, friendly and quite playful. •	Loves everyone, therefore not the greatest guard dog. •	Will bark to alert you of strangers, but otherwise not a barker. •	Adapts well to family life. •	Highly intelligent, responds well to patient, loving training. •	Accustomed to working in teams, therefore looks to you for leadership and guidance and teamwork together. •	Can be a chewer and destructive if left alone for long periods of time. •	OK, but not great, with other pets. OK with cats. Samoyeds are prone to separation anxiety. When left alone for long periods of time they are known to destructively chew and bark. Destructive chewing can be very aggravating for the owner and family so if the dog is going to be left alone for more than a few hours, perhaps this is not the right dog. They have been known to rip the stuffing out of sofas, eatthrough drywall, and even dig up the entire backyard. The excessive barking can be very aggravating for neighbors so it is essential that the dog is not left alone for several hours, especially outdoors. The bark of the Samoyed can be very intense and high pitched, making it more obnoxious than that bark of other breeds. Grooming of the Samoyed is rated as being high. It is important to note that when grooming a Samoyed it can be very difficult, yet needs to be done, and often. One has to commit to taking care of this breed's coat. The Samoyed must receive adequate exercise so they can vent their energy. When they are bored, they become very rambunctious and rowdy and even destructive. Their destructive behaviors are not only associated with separation anxiety but also with their boredom. The Samoyed because of their intelligent and independent nature can be somewhat difficult to train, but will respond to patient and persistent training. Voice commands are all that is really necessary. The commands should be given with enthusiasm and this will make training a little more fun. The Samoyed is eager to please and therefore will respond better to training when they are praised for following a command. Samoyeds are not easy to train because they do become bored and distracted. It is important to make it fun and energetic for them. They are known to be somewhat resistant to obedience training. When training Samoyeds it is important for the owner to establish a difference between words of appreciation and reward and words of correction. Respect training is definitely an option for the Samoyed owner. If you can train your Samoyed from a young age to be respectful, it can make living with your Samoyed much more pleasant. This can include training in the areas of, barking, chewing, jumping up, nipping, hanging onto objects, and so many other things. This is an excellent way to establish a leader and follower role relationship with your dog. Follower dogs are said to be happier because they are secure. They can trust that you have everything under control. They are also happier because they are going to be appreciated and complimented by people in public. They can also be confident that they know what the consequences of their actions are. They are going to be happier and healthier because they are using their brains and are spending time with the family they crave attention from.